I think you guys are all pretty familiar with Sabrina, the Polish Alcoholic. She is an amazing nail polish blogger from the Netherlands who has nails to die for. Seriously, I may kill someone just to get nails like hers (just kidding, but still somewhat serious). I did a swap with her about a year ago and got to know her a little bit better, and I can happily say that she is just as sweet as she is talented! So when she announced that she started to make her own nail polishes, I knew that I had to support her. I had one of these polishes on my wish list for a while, but when she came out with Good Luck Bear, there was no holding me back! I grabbed 3 polishes back before the holidays and now that I got my fill of red and green glitter, I’ve been playing with these! 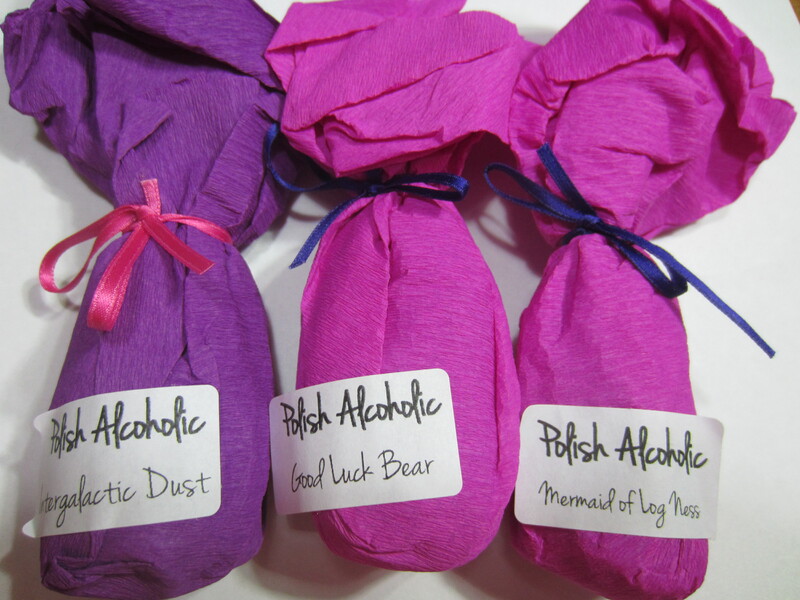 I picked up Good Luck Bear (left), Intergalactic Dust (middle) and Mermaid of Log Ness (right). Even Freddie had to get in on this action! Good Luck Bear is a grass green linear holographic. 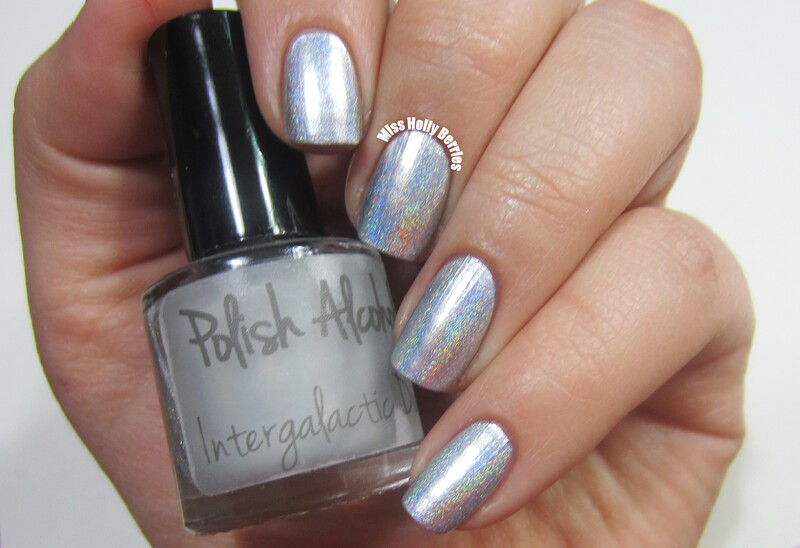 I have to say that my pictures DO NOT capture the true holographic-ness of this polish. 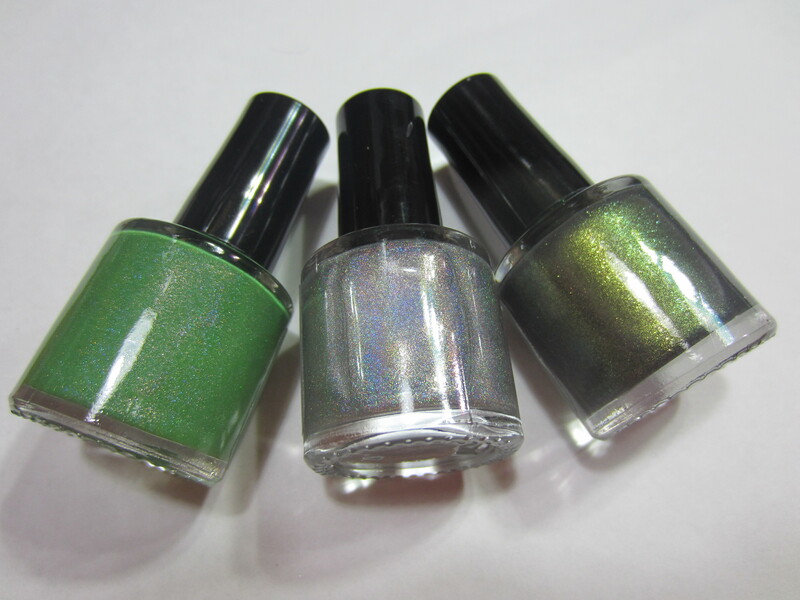 It is a true linear holo in a grass green creme base. It is stunning and reminds me of some of Enchanted Polishes pastel holographics. The formula was fantastic too! Almost opaque in 1 coat, but all of the pictures are of 2. It was the perfect consistency and dried really quickly. This is with a top coat. 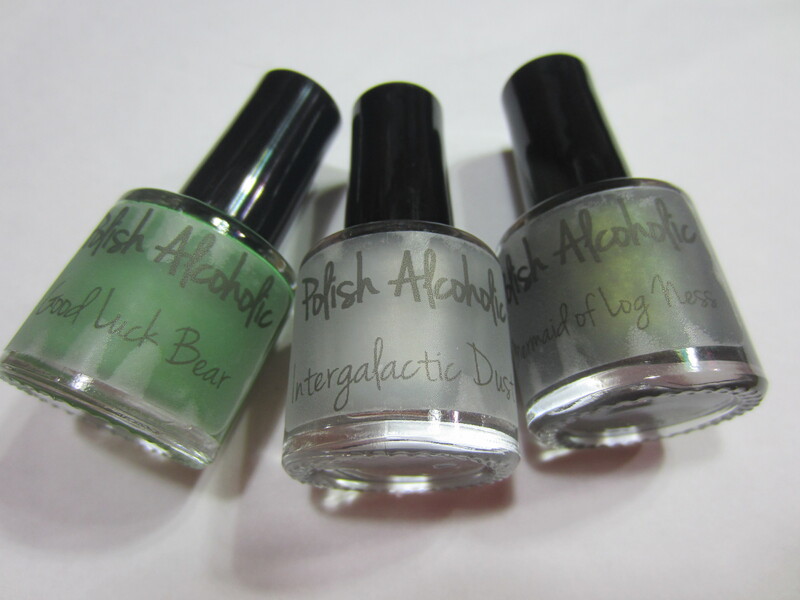 Intergalactic Dust is a linear holographic top coat. I picked this up because I have been craving holographic polishes in every shade! I want a red, white, turquoise, and every other color of the rainbow. So when I saw that Sabrina released a super holographic top coat I knew I had to have it. This has been on my wish list since she opened her shop! One warning to this polish is that because this is so dense and the linear holo is so strong, it does change the polish a little that you put it over. I have put it over black and it makes it look almost charcoal. I put it over white and it makes it look silver. But its so much fun playing around! And finally, we have Mermaid of Log Ness. This is a thermal polish so I took pictures of it warm, cold and mid-transition. Mermaid of Log Ness is a thermal shimmer that shifts from white with gold shimmer to an intense dark olive green with lime green shimmer. This color combination is incredible! I’ve never ever seen a thermal polish with this color combination. The formula on this polish was good but a little sheer. This is 3 coats and you can still see a little bit of the visible nail line when the polish is warm. But who really cares because the tips always look dark olive! Overall, I’m really impressed with these polishes! All of them have a great consistency and I think I will get a lot of use out of them! Check out Sabrina’s Etsy Shop to see other polishes she’s made, and check out her blog! CND Vinylux “Black Pool” Review! Good Luck Bear is spectacular! I love it and I want it! it is incredible! i wish the holographic showed up in my pictures more, but its awesome! Sabrina did a great job! 😀 So happy to read that you love them all! They look great on you. And Intergalactic Dust over Push and Shove is just stunning! Enjoy them sweetie! haha he wouldn’t move! 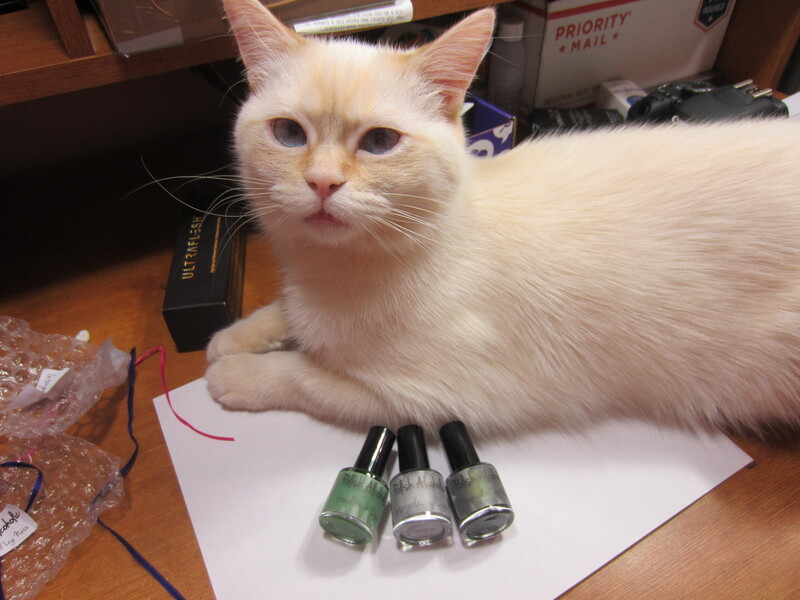 it was making it impossible to take pictures of the polishes so i just said screw it, hes getting put on the internet too. thanks for commenting! Good Luck Bear looks incredible!! I’m doing a St. Patrick’s Day race and already thinking about what green to wear! I’m wearing yellow now because it’s 20 below!